Ride along the temple on the west side again and over the natural bridge over the canyon just like you did to reach the second colossus, but this time you don't follow the path down into the valley but you continue straight after the bridge. 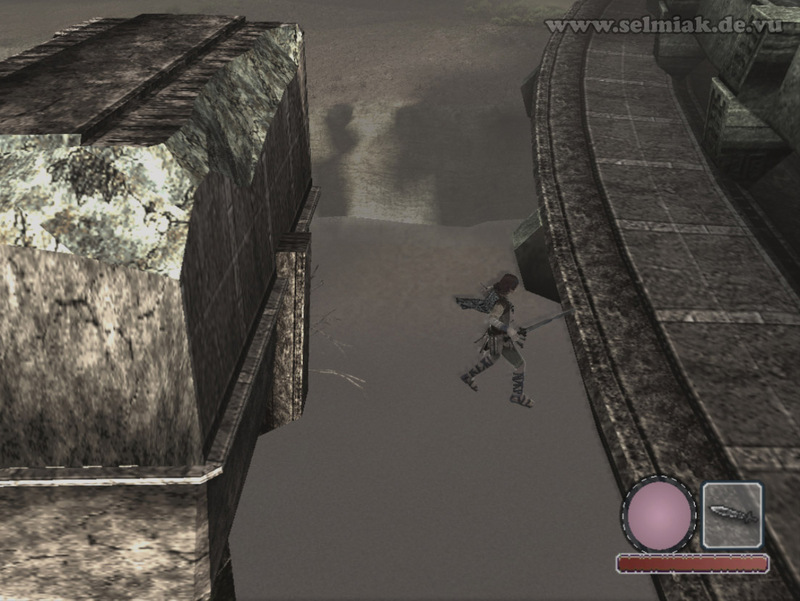 Well, a little bit left, but it's straighter than the way down into the canyon to the second colossus. Pass the small stone hill to your left unto you are on a huge plain. 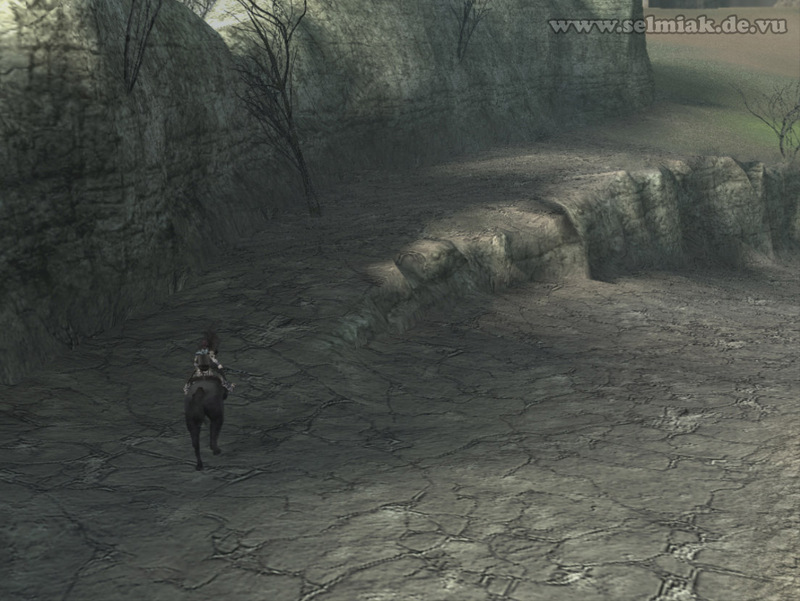 Turn about 45° to the left and ride all across the wide plain and aim for the dark place between the huge mountains. If you are unsure just use your sword, there is enough sun here. 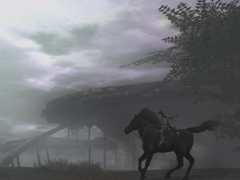 Here you ride along this dark path until you reach a big lake and your riding is interrupted by a short cutscene. This videosequence shows you the plateau on which the third colossus is waiting for you. The long way up on the west side of the plateau is also shown. 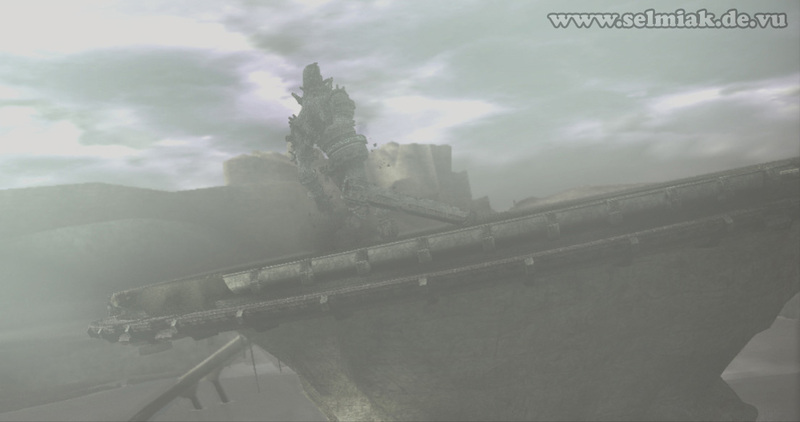 Use the way up until you are really close to the colossus. Now you have to jump two times and hold on tight and climb a bit around the stones up here and in no time you are at the third colossus. Please note that the longer you hold down the -button the farther you jump. 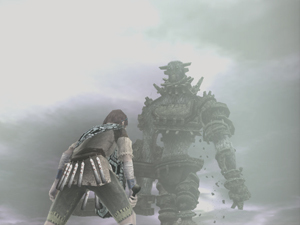 The 3rd colossus is really mean and angry. All the time he tries to hit you with his long and hard mutated arm and makes use of two different attacks. Number one is him getting huge momentum into his arm while you are far away. Then he smashes down his arm and tries to catch you like an annoying fly. His second attack is crushing his arm straight down onto you when you are near him and running around between his feet. He always tries to crush you. When he uses the attack here he gets huge momentum and smashes his arm to ground his arm remains stuck in the ground for a moment. If you managed to dodge the attack you can walk up on his limb but then there is no way to climb up higher from there because a ring made from stone around his arm is blocking. So what can you do to reach higher? 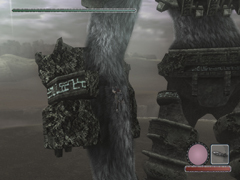 The solution how to climb onto the third colossus is quite easy once you know how, but it is difficult to find out about it. You should now take a good look at the huge stone circle on the ground in the middle of the plateau. This is part of the solution. 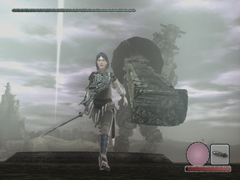 But before we do anything with it you should stand at the outer edge of the plateau and whistle and lure the colossus near. Once the 3rd colossus is really close to you and the edge of the plateau it is the right time to run to the stone circle in the middle of the plateau. Stand right on in and again attract the attention of the colossus. Of you are fast enough the colossus is still at the edge of the plateau and far enough away so that he uses his distance attack. He will get momentum for his arm and then smash it down in your direction. Needless to say, you have to avoid getting hit now, so run away from him, not to the left or the right but straight away from him. 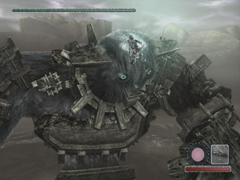 If you did it right the colossus will now hit the stone circle and this shakes his arm enough to break the stone ring on his arm that once was blocking you from climbing up higher on the colossus. 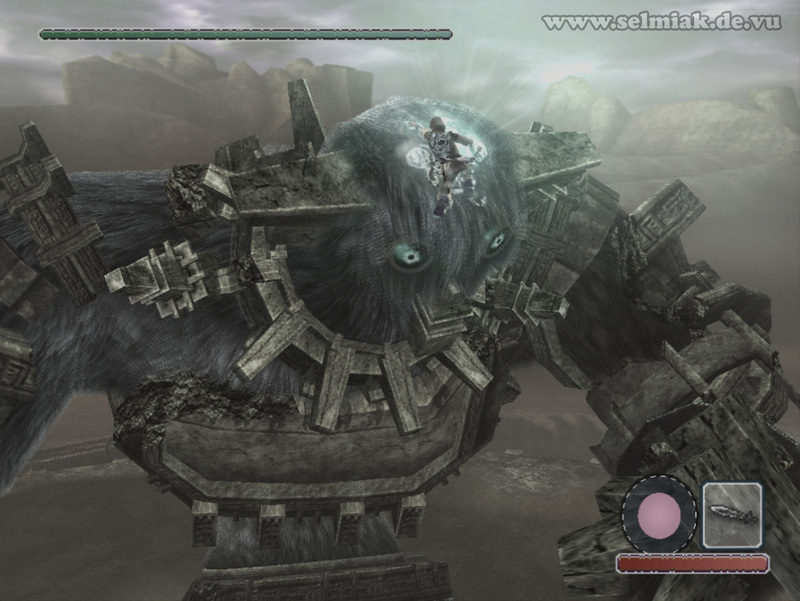 Now you have to provoke the colossus once again and make him do his long blow from the distance. While his arm is stuck in the ground again after missing you once again climb onto it and walk up on the arm. Now you can climb up his arm and climb higher and higher. If you need to rest to refill your grabbing powers the elbow is a good place to do so. If you managed to climb higher already you can always refill on his shoulder because now it's getting interesting. So climb up on his deformed head and make him hurt. But grab on tight as he doesn't like you being there and so he shakes and shakes and tries to shake you off. In case your grabbing powers are drained too low you can climb down onto his shoulder or his neck once he leans back or is standing still. It's quite easy to stand there to restore power. Sometimes he even shakes while you are standing there so you have to grab onto his fur there. After you drained about 50% of his health the ornament on his head vanishes and you can jump down onto his shoulder to regain some powers. Then you climb down his old back until you can't go down any further, then you just loosen your grip and drop down and while dropping down keep pressing . If you are lucky you land on the platform around his belly, if not you will just grab onto it. You can steer your direction a bit while falling. So make your way to the other end of the platform, to his bellybutton, this is where his last ornament is placed. Grab onto it and beat the life out of this ornament too. 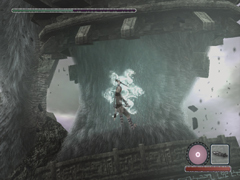 It is also possible to jump from the arm you use to climb up directly to the platform around the belly of the third colossus but this is harder than the way described above.